We are presently huddled bang near the end of the final quarter of the year, getting ready to gear up for the new challenges posed by 2018. Experts say that the upcoming year is going to be tough for digital marketing since it will be a transition period. While 2017 has had its share of ups and downs, and we are still on a bumpy ride, 2018 is slated to be a year of unnerving surprises, making the ride bumpier still. In fact, it is estimated that in 2018 the average firm is expected to allocate 41% of their marketing budget to digital marketing, and this rate is expected to grow to 45% by 2020. But you need not worry one bit! Our team has collated all the available resources to help you plan the upcoming year without a hassle. Finding new clients during this transition period may be difficult, but it is not altogether impossible. If you ever find it tough to do it yourself, you can always consult our team of experts for help. Survey of 2,500 digital marketers, respondents reported on what marketing activities generated the best ROI. You may already have a business website, but have you optimized it for smartphone users? Do it quickly, because smartphone users are rising at a steady rate. Going up at a rate of 0.2% every year, smartphones are already slated to reach their peak in 2019. So, during the transition period, you can expect a lot of traffic, and eventual leads, from smartphones and tablets. It is high time that you jumped on the bandwagon and coerced a few good sales out of these greatly accessible devices. Not sure how to optimize your business website for smartphones? Call Versatile for a free consultation and our experts will answer any questions you have. While apps may have primarily been used for the gaming sector during the past few years, they are gradually gaining momentum for business as well. Did you know that over 97% of folks tend to read push notifications? Compare the stat with email reads which barely cross 5%, and you have a very strong reason to get a business app in the pipeline. The amazing thing about push notifications is that the user is bound to read it before swiping it off. And who knows, quite a few may even go ahead and provide a positive feedback on it! While smartphones and their apps may have been slated to rule the general populace arena, B2B consultants still prefer the email marketing and business website mediums. Your B2B clients would prefer to go through your email campaigns rather than have to download an app to access your services. And these mediums are predicted to remain the same in 2018. So, don’t let go of that email marketing campaign just yet. 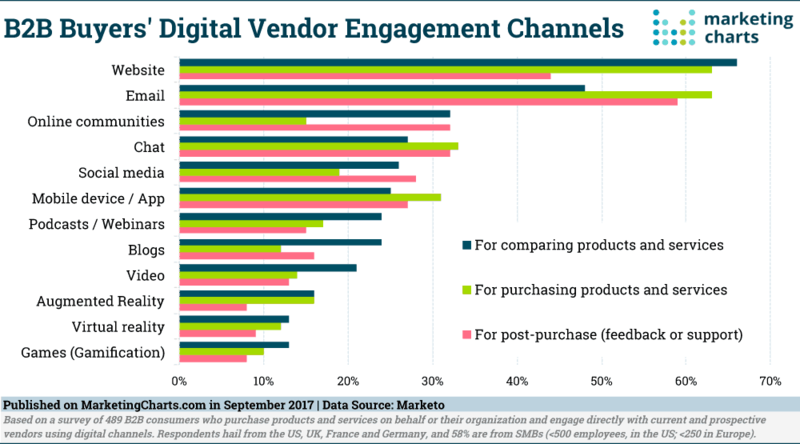 When it comes to digital engagement channels, websites and email remain the clear leaders for B2B buyers. Have questions about email marketing? Versatile can even help you in increasing your sales over the platform. Social media marketing has been gaining gradual momentum over the years. It has been confirmed that the ad sales over social media platforms are at an almost equal footing to those over television channels. (3.22 to 3.17 (broadcast TV to Social Media) In fact, social ads have even pipped TV ads in attracting a more popular fan base for any television series. Add to that the lower budget of SMM and there you have it – your very own lead generating engine! Which Social Media Channel Should I Invest In? Facebook is expected to remain, king, with 90% of social media users utilizing the platform. Instagram is expected to grow, from 32% penetration to 47% by 2020. Other social channels with baked in advertising features, such as Pinterest and Twitter, will continue to have relatively low penetration, peeking around 33% of users by 2020. Thus, suggesting an emphasis should be made on Facebook and Instagram channels for social advertising. Social media marketing allows companies to reach their customers where they are, while also characterizing their brands and expanding their customer base. If done correctly, social media marketing can also increase the efficacy of other marketing techniques – including SEO and SEM – by helping build natural links, and drive traffic, awareness, brand recognition, and goodwill. 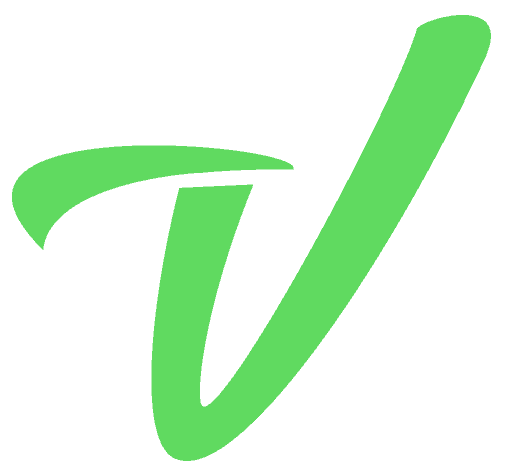 If you have been struggling with social media strategy, management, or advertising Versatile can help. While digital has well and truly overtaken TV as the largest advertising medium, offline still commands a majority of ad sales. The ratio of digital ads to offline marketing is gradually increasing over the years. Currently sitting pretty at 0.66, the ratio it is slated to keep rising in 2018. Experts predict that by the end of 2019, the ratio will go beyond 1. What used to be spent on radio, television, and newspaper is now being spent on search, email, and social. So, cash in on the opportunity as long as it is cheap at the moment. Prices are bound to soar as the upcoming year ends. For a half decade, investments in traditional advertising have consistently dropped by single-digit percentages each year. Digital marketing spend, by comparison, has consistently grown by double-digit increments year after year. 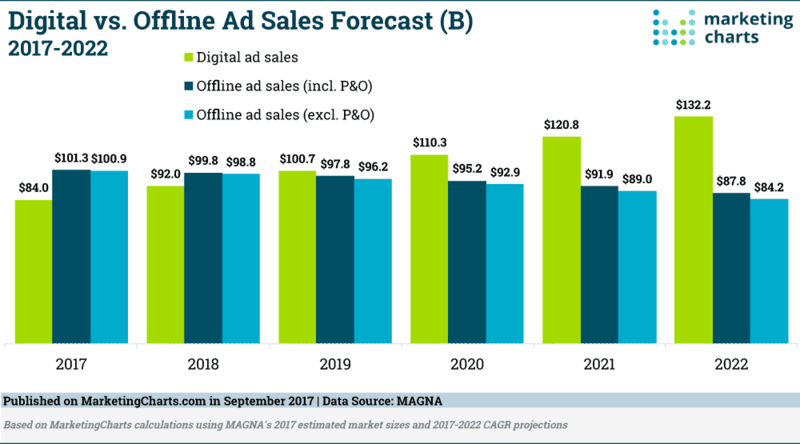 Did you know that by the end of 2019, market experts have predicted that the digital ad sales will exceed the offline? Thus, if you are at a business that likes to stay ahead of the competition a couple of years, there is no better time to start investing in digital marketing. Your digital sales may not be equal to your TV sales at the moment. However, they are bound to keep rising as the months’ pass. Row, row, row, till you reach your destination! 2019 is bound to be a promising year for digital marketing. And the 2018 transition will be highly beneficial to all both small and big businesses! We covered quite a wide range of topics in this article. Here’s a quick summary of which marketing strategies and tactics you need to keep an eye on in 2018. 72% of research for a future purchase starts on Google. Content Marketing can cost up to 62% less than other forms of advertising while generating up to three times as many leads. 2017 has been the most active year up till now for digital marketing. Thus, the time is ‘now’ when companies should start incorporating these trends into their strategic planning process for 2018. Hopefully, this article was helpful in providing information that can guide you about how to budget for marketing your business successfully in 2018 and where you should be investing your marketing dollars. 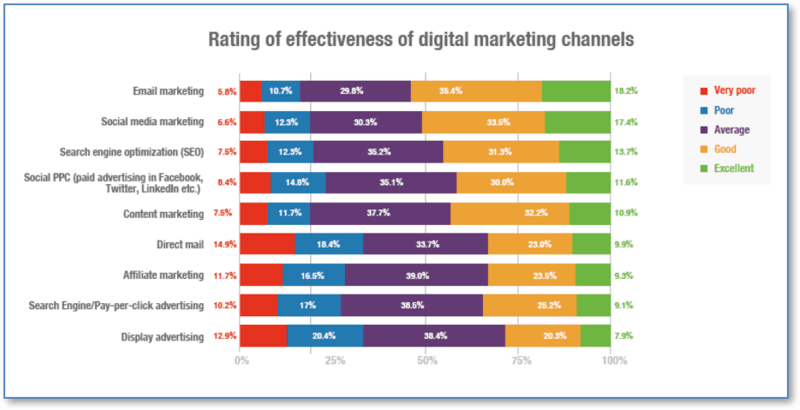 Which marketing channels have been most effective for your business in 2017? Share your comments below! If you found this article useful, please share it with someone else who might learn something from it.